Spain and Italy may have met in the two previous European Championships, but this year’s round of 16 clash offers a rejuvenated tactical clash following poor World Cup campaigns. The current holders and finalists feature in the tie of the round, with both sides making slight modifications since the former’s convincing 4-0 win in the 2012 final. Spain have transitioned from the patient possession based football orchestrated by Xavi and Xabi Alonso, and now aim to transfer the ball into advanced zones at a quicker rate, while injuries to Claudio Marchisio and Marco Verratti, combined with the lack of a top-class forward will see Italy play destroyers, here. In the 2012 final, Spain utilized Cesc Fabregas upfront, and while many assumed the Spaniard operated as a no.10, his runs in the final third were similar to a natural centre-forward. The two teams met earlier in the tournament, where Fabregas dropped deeper into midfield to create an overload, but they were outplayed by a proactive Italian side that afternoon. One of the main differences in Vincent Del Bosque’s current side witnessed the emergence of Alvaro Morata at the international level. With that being said, Morata offers a different dimension to Spain’s attack. Capable of equally running the channels and coming short to link play, the striker’s willingness to make quick darts beyond the defence forces the opposition deeper, and creates more space for the Spanish midfielders. The other notable change involves the inclusion of Nolito. David Silva roams into central areas and around the final third from the right flank, whereas Nolito hugs the touchline, constantly aiming to cut onto his stronger foot to trouble the goalkeeper. This essentially makes Spain more direct from an offensive perspective, and has seen Del Bosque’s men serve as the tournament’s standout performers thus far. This could explain Del Bosque’s decision to field the same XI for all three group games, but following a loss to eventual group-winners Croatia, a hint of caution may be implemented for the knockout stages of the competition. Spain have yet to concede a knockout round goal during Del Bosque’s tenure, and with teams aiming to break into space in wide areas on the counter, he may seek further control in midfield as the holders increase their emphasis on control. The current midfield of Andres Iniesta and Fabregas offer a combination of direct passing and dribbling, but Del Bosque could turn to Koke’s passing and combative presence in central areas against a reactive Italian side that will aim to fluster the Spanish midfield. It’s unlikely Del Bosque will field another dribbler in Thiago from the start of the match, but he could turn to Bruno alongside Busquets if really wants to neutralize the Italians on the counter – Italy adopting a deep block wouldn’t require Bruno, however. It’s difficult to see Antonio Conte straying away from his 3-5-2, with the only concern involving Antonio Candreva’s absence. Candreva has played a crucial role in terms of creativity as Italy transition into a 3-3-4 going forward, and his injury could see Matia De Sciglio operate as a right wing-back. 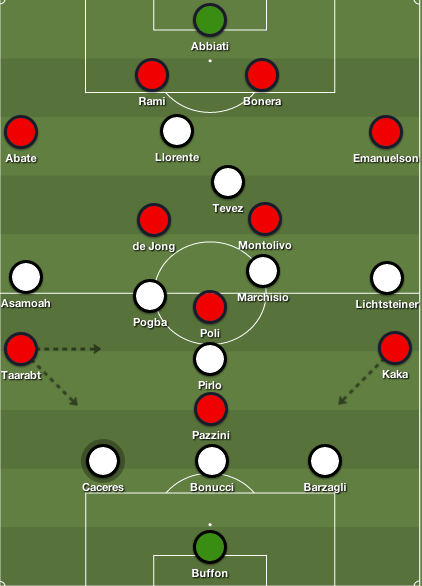 In comparison to the Spain XI, this Italian side is slightly underwhelming, but they understand their roles and will be focused on executing Conte’s game plan. Daniele De Rossi is expected to roam around the back four for protection, while Emanuele Giaccherini and Marco Parolo disrupt play in midfield and wide areas. Both managers encourage their full-backs/wing-backs to surge into advanced areas in possession, so the battle out wide will be interesting. Likewise, Alvaro Morata will likely be instructed to close down Juventus teammate, Leonardo Bonucci, when he carries the ball forward. But where Morata will likely be outnumbered in Italy’s third, Gerard Pique and Sergio Ramos will be tasked with monitoring Eder and Graziano Pelle. The Italian duo have both scored key goals in Italy’s group-stage victories and attempt to combine upfront, and possibly encourage the midfielder’s to make runs into the box. Nevertheless, while many hailed Italy’s defensive display against Belgium, Conte’s men have to be better against a side that will prefer to be patient in possession and penetration. 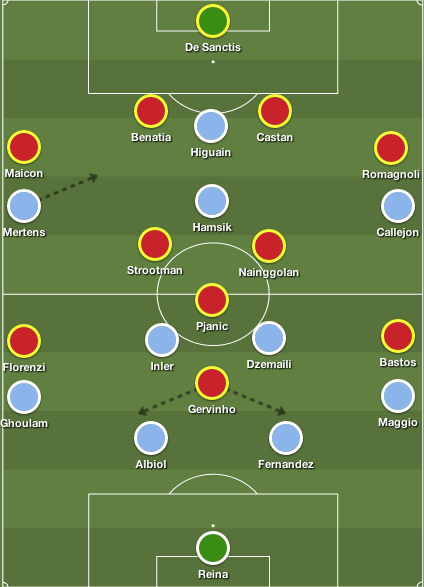 More so, the Italians conceded several legitimate goal-scoring chances against the Belgians that night, often resorting to cynical fouls to halt potential counter-attacks. Spain’s individual talent could be decisive, but they face possibly their biggest test of the tournament in breaking down an Italy back-line that offers experience and grit. Essentially, Conte requires need a valiant team effort throughout, but Spain’s overload in midfield and the new direct options available could prove an insurmountable task for the tenacious Italians. There’s a contrasting feeling looming around the upcoming Euro 2016 tournament following the decision to include eight additional teams. Although it offers an increased viewership due to a larger tournament, the overall quality drastically decreases due to a limited amount of great sides.. Now, the inclusion of eight teams paves an easier route to the knockout stage, and can arguably hinder the tournament from a footballing perspective. Frankly, that belief hinges on the true definition of ‘entertaining football’ – while one used to associate the term with Spain’s ability to retain possession and pass their way through opponents, the sudden shift in success involves organized defending and quick transitions on the counter-attack. Leicester City’s Premier League triumph, combined with another successful Atletico Madrid campaign – despite finishing the season trophy-less – suggests teams may attempt to replicate their approach considering the tournament favourites’ insistence on possession dominance. More importantly, despite the inevitable likelihood of several limited sides reverting to deep defensive blocks and solely attacking on the counter-attack, realistically, the ploy is fairly logical. Defensive solidity is essential in a knockout competition, and considering avoiding heavy defeats should guarantee progression beyond the group stage, tight games could surface throughout the tournament. This reactive approach, however, should favour several tournament underdogs if executed properly – the best teams in the world possess various attacking options, and would clearly prefer to operate in space opposed to probing until they find an opening. Likewise, the lack of a genuine great side or tournament favourite equally increases the tournament’s overall interest. The quality is fairly scarce, but ahead of the opening match, it’s difficult to fully justify a clear favourite. Spain, Germany and France dominate the conversation, but the European giants all possess positional deficiencies that inhibit the belief that they’re superior to their rivals. Reigning world champions Germany and two-time defending Euro holders Spain can no longer turn to reliable goal-scoring centre-forwards and may both encounter issues providing penetration in the final third. Mario Gomez, Alvaro Morata and Aritz Aduriz will be responsible for the goals despite the possible stylistic inadequacies, whereas Mario Gotze and Cesc Fabregas have featured as significant false-nine options in past tournaments – the former is arguably better in midfield, whereas the latter’s role requires out-of-form wide players David Silva and Pedro Rodriguez to offer penetration. The reigning world and European champions pose different tactical dilemmas ahead of their opening group games, though. 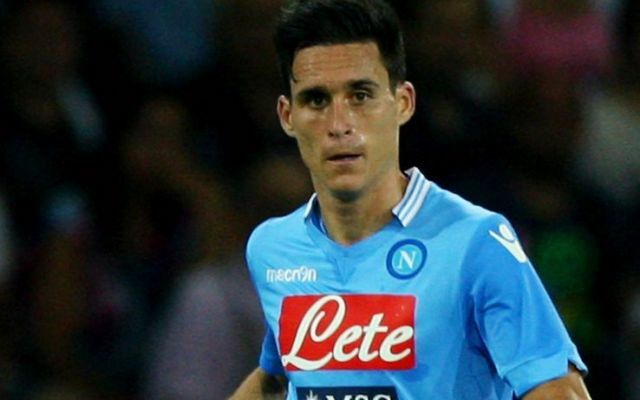 Often accused of over-possessing the ball, Spain have additional direct options in Lucas Vasquez and Nolito to offer variety to their patient possession-based football. Germany, on the other hand, have the option of utilizing Gomez as a legitimate target-man, but will be without key players in Ilkay Gundogan, Anthony Rudiger, and Marco Reus. Meanwhile, hosts, France aim to hoist their first major tournament in 16 years, and the talent Didier Deschamps’ possesses suggests Les Bleus may never receive a better opportunity to end the drought. The hosts have several direct options like Antoine Griezmann and Paul Pogba that can play off Olivier Giroud’s impressive linkup play, but defensive absentees Raphael Varane, Mamadou Sakho, and Jeremy Mathieu leaves the French with very few options in defence. It’s also difficult to overlook that France’s recent tournament exits have come against Spain and Germany, and Deschamps’ men still look devoid of the experience to overcome their rivals in a head-to-head showdown. Elsewhere, the same issues arise amongst the remaining notable contenders. Italy possess the best defence and goalkeeper in the tournament but offer no creativity in midfield due to injuries to Marco Verratti and Claudio Marchisio, while their attacking options are extremely underwhelming. Antonio Conte has been heavily criticized for his selection prior to the tournament, but from an optimistic perspective, the Italian manager’s first two seasons at Juventus were fairly similar, with various players from midfield players scoring goals. Conte’s attention to detail, and overall cohesion in attacking moves will define an Italian side that appears sturdy at the back. Cristiano Ronaldo is the best player at Euro 2016, and a free role upfront ensures Portugal won’t be overloaded down the left. Fernando Santos midfield is one of the best in the tournament, and though they also lack major tournament experience, they’re capable of outmuscling and dominating most sides in central areas. The movement of the Portuguese attackers will be interesting, but the defensive options at Santos’ disposal places significant responsibility on the midfield to ensure their shape isn’t disjointed – Ronaldo’s role will always be the difference-maker but Santos must find balance quickly. Oddly, it’s difficult to identify better striker options in this year’s tournament than the four men Roy Hodgson possesses in Harry Kane, Jamie Vardy, Daniel Sturridge and Marcus Rashford. However, with England straying away from a flat 4-4-2, and the rapid growth in youthful, highly-technical players amongst the ranks, England currently suffers from the same issue that’s plagued them for years – striking the right balance and fielding his strongest XI. Needless to say, while many other teams would welcome England’s striking issues, like Portugal, their back-four is undoubtedly the clear weakness. While this was expected to be the tournament Belgium evolved into world beaters, the same questions are being raised regarding their role amongst Europe’s elite. It still feels like Belgium’s success rests on the form of Eden Hazard and Kevin De Bruyne as the front line hasn’t substantially improved, whereas Marc Wilmots is still without natural full-backs. While Belgium’s individual talent still remains – they can count on a rejuvenated Moussa Dembele, possibly the best Premier League’s best centre-back partnership in Jan Vertonghen and Toby Alderweireld, and two top-class attacking midfielders in Kevin De Bruyne and Eden Hazard – the pressure is now on Wilmots to put the pieces together to launch a deep tournament run. The tournament is still filled with stars like Gareth Bale, Robert Lewandowski, and Zlatan Ibrahimovic that will be aiming to overcome a lack of genuine support to make a statement, whereas Croatia’s impressive midfield – that still lacks a holding midfielder – is unlikely to make up for a tireless, yet often frustrated Mario Mandzukic and an unconvincing back-line. With more room for error, and no real powerhouses – this is possibly the antithesis of this year’s Champions League – it really leaves the tournament up for grabs. Denmark (1992) and Greece’s (2004) triumphs – in much difficult circumstances – offers every team a sense optimism, and with the likes of Iceland, Turkey, Austria and Slovakia also involved, this is possibly the most open tournament in recent memory. It certainly may be a truly dull spectacle from a football standpoint, but the possibility of several winners guarantees a high-level of excitement. So many teams look far from the finished product. And with the international game drastically suffering with every passing tournament, the level of unpredictability presents a breath of fresh air that many will appreciate. EURO 2016 is unlikely to be remembered as the best tournament of our lifetime, but the inaugural 24-team format has potential to usher in a new era courtesy of several shock results. Perhaps now is the time where the impossible becomes possible.